Hello! Bluefoxxo here! This is a simple sprite shop! 1) Pfq rules apply 2) Please no prepaying, as its against pfq rules. 3) Use the form! 4) If payment is not recieved within 48 hours after completion, your sprite will be placed into the adoption center! 5) If you want to order 2 or more at once, feel free to place multiple forms in your post! 6) Each section has a different codeword. 7) Please do not sell any of my sprites for more than what you paid for. 8) THIS RULE APPLIES TO ALL STATIONS! IF you request a pokemon from gen 6+ (Variants, exclusives and megas all live within this range!) You will NEED to request permission Here! Oh look! Blue is advertising stuffs! 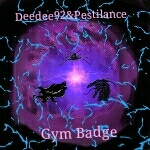 Welcome to the retype and fusion station! Simply put, here you can change your pokemon's type if you are not happy with its current type, and combine them! 1) All rules from the first post apply 2) Do not touch the type DNA vats, especially that dark purple one... 3) No prepaying 4) The codeword for this station is "Are you a bleufoxxo?" A fusion can be 30 - 50 gp based on complexity. Welcome to the Snowglobe, *NEW* Holiday, ?? ?, ??? and ??? Stations! 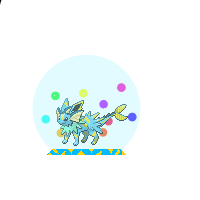 Simply put, I will put your selected pokemon in a snowglobe, like this shiny wynaut! and who knows what I will do with the last stations. 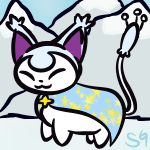 The Snowglobed pokemon will be 50 gp since I make the Snowglobes from scratch. 1) All rules from the first post apply. 2) The password for snowglobes is "I am a chilly bleufoxxo"
This will change with the new holiday approaching, and these are going to be 50 gp per sprite. 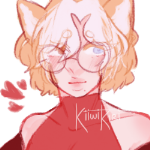 Form for a holiday sprite! 1) Please treat me and others with respect 2) First come First serve 3) Use the adoption form 4) The adoption center codeword is "You are possibly a BleuFoxxo"
Here is where I put sprites that I make when making new ideas for stations for the opinions of everyone. And now the shop is open! all right! i can do that.